Respond to transmission line faults with minimum cost and maximum efficiency. Extremely precise fault location on overhead power lines can significantly reduce costs for utilities. It enables operation and maintenance engineers to respond more rapidly to events, get to the site of faults faster and correct defects. With Travelling Wave (TWS) Fault Location techniques, operators can pinpoint faults to within one tower accuracy - something far beyond traditional impedance methods. Accurate results from circuit trips are automatically calculated and displayed in the dispatch centre within minutes of the event occurring. Fast, automatic dissemination of results gets the information directly to maintenance teams without the need for a protection engineer. Returns quality results for all types of faults, including high resistance ground faults and open circuit. Accuracy is independent of line length, remote end infeed, non-uniform line construction, conductor asymmetry and mutual coupling. Faster restoration time reduces system risk posed by the possibility of a second or third coincident fault, and reduces uneconomic generation costs needed to maintain system security during the line outage. Three Qualitrol devices (TWS FL-1, TWS FL-8 and IDM+) provide unparalleled travelling wave fault location capability to suit every power system need. These products can be connected with other Qualitrol devices into a networked fault monitoring fleet. for monitoring faults on a single circuit. for monitoring faults on 2, 4, 6 or 8 circuits. 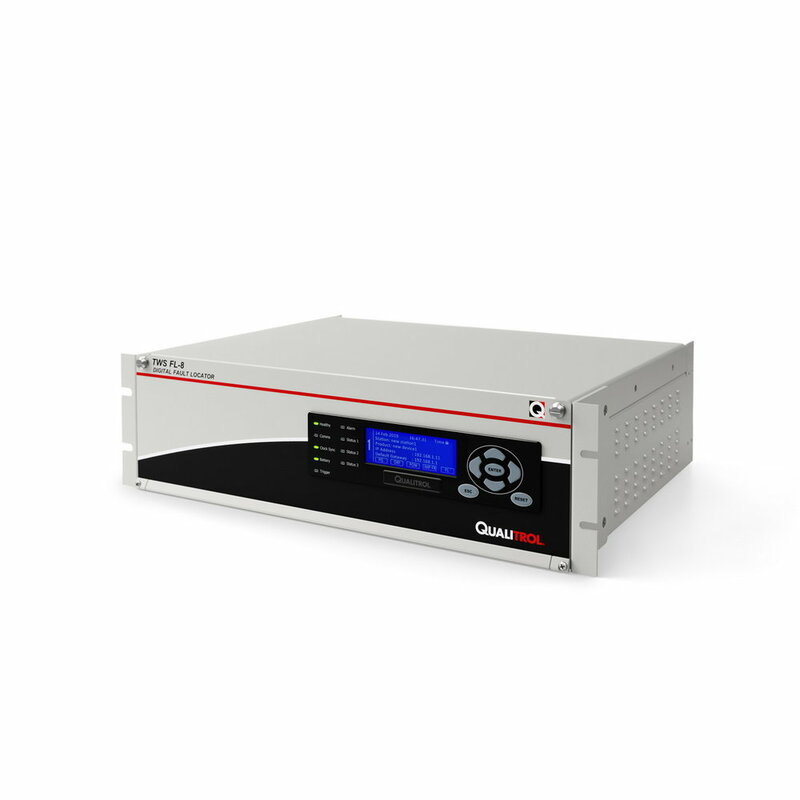 Qualitrol IDM+ for fault location capability in a multifunction power system monitoring device. Maintenance crews can be alerted by email notification, with embedded map view. Configurable circuit / line parameters, structure IDs, preferences and favourites. Customisable fault location waveform viewer, tables, records and reports. Distance to fault calculation to within 1 tower or up to +/- 60 metres. Qualitrol iQ+ is not just for Fault Location. It is a complete network monitoring software package for the configuration, collection and analysis of data from the Qualitrol range. This includes Digital Fault Recording, Dynamic Disturbance Recording, Power Quality Monitoring and Phasor Measurement. With IEC 61850 Ed.2 fully utilised within the TWS FL and IDM+ devices, the Qualitrol PSM platform is designed to meet both current and future state substation automation architectures. location challenges and the travelling wave method. TWS lets you track intermittent self-clearing faults and focus maintenance at the right spot to prevent a major breakdown. Most overhead line faults are transient and can be successfully re-closed. However, multiple trips can occur at the same place over time, due to a damaged insulator, growth of vegetation or conductor clashing. Accurate fault location methods can pinpoint these trouble spots, allowing planned maintenance to be undertaken to rectify the ‘minor’ transient problem before it becomes a major or permanent one. Fewer line trips also reduces the number of voltage dips and subsequent customer complaints. Qualitrol TWS FL goes head-to-head with 3 other Travelling Wave Systems. An Asian transmission utility invited four companies, including Qualitrol, to demonstrate the capabilities of their TWS Travelling Wave fault location systems. Each company had two days to install their equipment and on the third day the faults were induced. Five tests were carried out over three days with one clear winner at the end. Browse our technical papers on travelling wave application to find out more about this valuable application, including how TWS compares to impedance methods, how it has been used in sub-transmission applications, as well as in underground cable, and how it is benefiting utilities far beyond its core application. If you're operating a Transmission or Distribution network and are dealing with challenge of locating faults in manner that is both timely and cost-effective, our team would be glad to discuss how Insulect and TWS can help your organisation.